It is not the purpose of this work to propose a specific format for the settlement of the city's current difficulties with the valley, to resolve the environmental questions associated with Los Angeles's proposed groundwater pumping program, or to promote any cause associated with the developing situation in the Owens Valley. But by performing the essential historical task of separating what happened from what did not, and by distinguishing in this way the choices which have been made from those which have yet to be decided, it is my hope that this effort will help to establish that common basis for understanding which is essential for the debate over specific issues to proceed most effectively. This book, then, is scarcely the last word on the Owens Valley conflict: the final chapter, after all, has yet to be written. The story that has emerged here is at once very different and more troubling than the conventional treatments of the conflict as a simplistic political morality play. Any attempt to deal with so controversial a subject, however, is almost certain to spark controversy itself. For that reason, with the exception of a small collection of private letters, this work is constructed entirely from the published documents and other materials available to the general public, anchoring the narrative in sources the reader can consult to trace the line of my argument on any point with which he or she may disagree. In addition, the work as a whole has been reviewed for technical accuracy by officials of the Los Angeles Department of Water and Power, although the department is in no way responsible for the content of this study or the conclusions drawn from it. 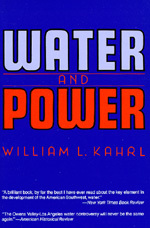 William Kahrl is the editor of The California Water Atlas and the author of Water and Power, a history of the conflict over Los Angeles' water system.